Crinkle your nose and smile! I suppose we all end up having a potty training success story, don’t we? (Gosh, I hope so! Until you get pregnant, or get old, but that’s another story, ha!) But in the middle of training a tiny tot how to use the pot, it can really feel like an eternity and success is far away. At least, that’s how I’ve been feeling for about six months, like I was once again walking in the dark because Kevin and I had completely run out of ideas for training Gabriel. 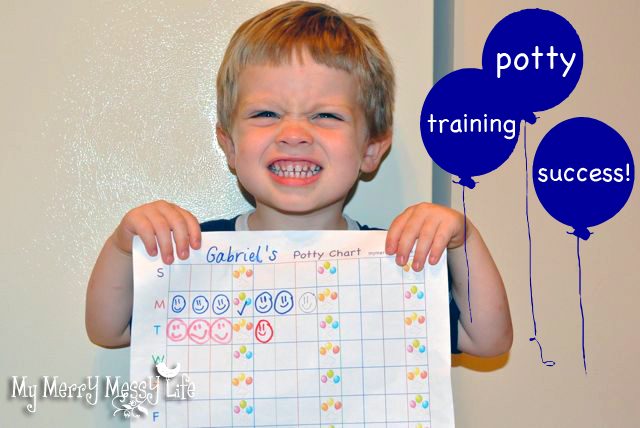 We started training him back in February with the intense 3-Day Potty Training method. My good friend Christina had recommended it and it worked very well with both of her kids, so, having no other ideas and knowing I wanted him potty trained before he was three, I jumped on it. My husband and I BOTH got the flu on day two, which prolonged the three-day process into a five-day process. After five days, he was doing pretty good and had grasped the concept that pee is meant for the potty. So, it was pretty successful, or so we thought. because Grayson’s decided to take it down! We kept him in diapers during nap time and bedtime, but he was in underwear or running around loose and fancy free (smile) the rest of the day (his preferred method!). For a few weeks, things were pretty good, but because I’m not terribly consistent with anything, he started slipping and I was finding puddles all over the house (thank goodness most of our house was hardwoods!). If I stayed on top of him and took him to the potty every hour, he would go and be fine. Otherwise, he’d never tell me he needed to go and would go on the floor or in his pants. It drove me totally batty because I was literally cleaning pee up off the carpet all day long. So, I didn’t punish him for several months, but then I started to lose my mind and I regrettably put him in time out a few times. Now, granted, it DID work for a few days. He’d go on the toilet and the accidents greatly decreased. Then, we made the big move from Pennsylvania to Georgia in July and things got thrown all outta whack again, except, this time, he was having accidents in my mom’s house who’s house is covered in wall-to-wall thick, plush carpet. YIKES! He even started having accidents on the upholstery, so I knew I had to do something. My mom recommend using a chart, and really encouraged me to stick with it. I thought it might work okay for a few days, but then would fail, but tried it anyway. To my amazement, it has finished the training! 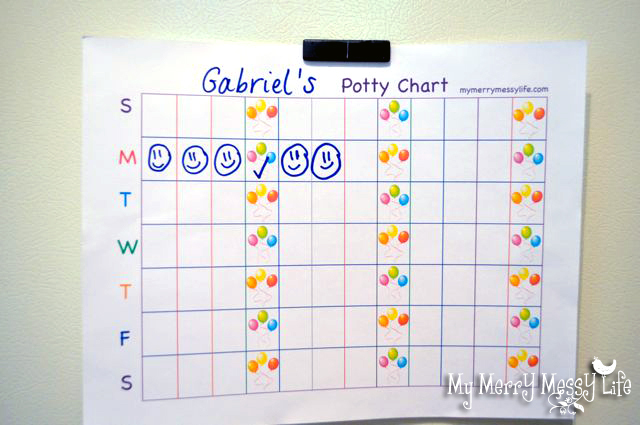 Here’s how we do it – every time he goes to the potty, he gets one smiley face or sticker. If he goes all by himself (this was my dad’s idea) he gets two smiley faces. That part has worked wonders for getting him to go by himself. I’ve also started to use it as a way to teach him how to pick out his own clothes, get dressed, clean up his toys, and share with his little brother. 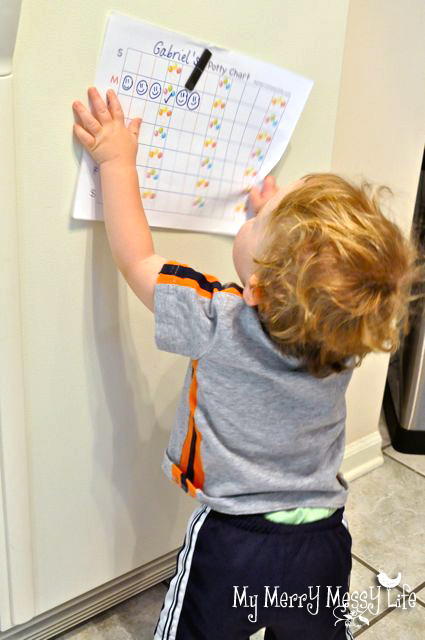 So, it has become a reward chart and has easily helped me to teach him all the skills I wanted him to learn – making my workload lighter (great with #3 on the way! ), making him more independent and confident. Kevin and I decided that once he gets three smiley faces, he could get a treat (the balloons) – watch videos, TV, or have his favorite sweet treat (those are three of his favorite things to do). And once he gets a whole week of 2 treats a day, he gets to earn a bigger treat, like a toy or to go get ice cream. I am absolutely loving this system because it puts such a positive spin on teaching him the skills he needs to learn – it makes it FUN and rewarding. I was going the other direction before and it was so negative, punitive, and just no fun at all. It put both of us in a bad mood and at odds with one another. Besides, it wasn’t working! Gabriel has been accident-free since we’ve been using the chart (about three weeks). It has been a lifesaver for our family, and my parents’ carpet! I will use this over and over again. He is still in diapers at night, but pretty much stays dry during naps. Sometimes some good old fashioned advice is just what you need for success.